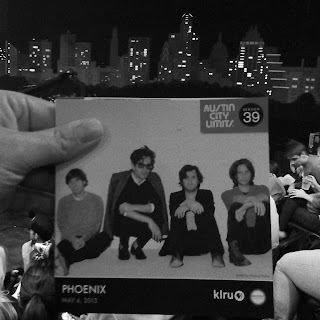 Last night's performance by Phoenix for Austin City Limits Television was one of the most memorable tapings I have ever had the pleasure of attending. I have been lucky enough to attend more than a dozen ACL tapings and I have seen different artists approach the format in different ways. Radiohead used the television time-capsule to capture the band in the midst of a tour to support King of Limbs. Those of us who already love Radiohead loved hearing the new songs showcased live but in television terms it captures a very specific moment. Jack White's taping perfectly captured the musical and visual aesthetic of his Love Interruption tour but he also performed re-workings of familiar songs. Hearing full band performances of White Stripes songs was a revelation. Phoenix approached their taping as though it were a time-capsule for their whole career up to this point. It was an incredibly confident performance by skilled musicians with an arena-ready energy level. The band opened and closed their set with Entertainment, the first single from their latest album Bankrupt! but the set wasn't heavy on new songs. It was a perfect showcase setlist highlighting some of the peaks in their 18+ year music career. It's a setlist you design for an audience who doesn't know you as well as one that adores you. In other words, your most undeniably great songs. Personal highlights were numerous but hearing Thomas and Christian do a stripped-down version of Air's Playground Love from The Virgin Suicides soundtrack was a definite, I die, moment for me. There were two stripped-down songs with just Christian and Thomas, which Thomas performed from the center of the crowd on the floor. During the last full song, before the Entertainment coda, Thomas walked the mic out into the crowd. This is something I have seen him do before and I have described it to people but there's something truly electric about it in person. Rather than walk with a cordless mic, which would be incredibly simple Thomas has a VERY long, bright red microphone cable that he winds through the crowd. He barely even used the microphone to sing, the band just drilled away at the song and Thomas walked off the stage, up to the top of the bleachers winding the cord through the crowd. There is something very exciting about it, it's exciting to have the performer break the fourth wall and there is something that just seems both dangerous and communal about the mic cord. We work together to keep it from getting caught on things or each other, it's held up by the crowd so that Thomas can get as far as possible. The presence of camera equipment made the whole thing that much more complicated. The cord had to wind through the crowd as well as all of the equipment needed to capture a musical performance for television. Thomas used a wall-mounted camera track to climb into the balcony and momentarily wrapped the cable around the robotic camera. On his way back to the stage for the final bow, he managed to ensnare the tripod of one of the crane-cameras on the floor. He threw the microphone's wind-screen into the audience at the end of the set then he threw the microphone under the drum-riser. Last night's audience walked out of the theater feeling pumped. There was an electricity in the air and Phoenix was the source. They played like a band with something to prove and they proved it. They are one of the best touring bands in the world and if you don't believe me just watch them on your local PBS. 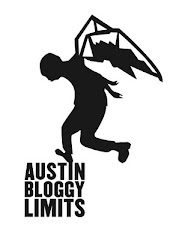 The Phoenix episode will be part of the 39th season of Austin City Limits, which will begin airing in the fall of 2013.